Representing chamber of commerce executives from IA, MN, ND, NE, SD and WI. 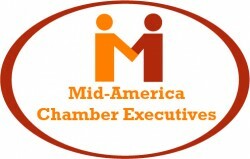 Mid-America Chamber Executives (MACE) is always interested in finding quality speakers from within the chamber leadership community. We are searching for political insiders, chamber executives and others that are willing to share their expertise and provide real world examples in various chamber disciplines. Presentations are currently scheduled for 45 minutes to 60 minutes in length, and may include some questions if time allows. The MACE Advocacy Alliance presents a two day Policy Conference where chamber executives and public policy staff come together to learn ways they can promote regional issues to their members and become more involved in the policy process. Interested parties may submit their information by completing the form below. All interested presenters must submit their information no later than September 30, 2017.